intervention techniques to live their best quality of life. “Physical Therapy (PT)” means corrective rehabilitation provided by licensed practitioners through the use of physical, chemical and other properties of heat, light, water, electricity, sound, massage and active, passive and resistive exercise. “Occupational Therapy (OT)” is the restoration, modification, compensation, or adaptation of skills and/or abilities, to increase an individual’s capacity in the performance of any and all activities. It focuses on the factors that may impede or restrict the ability to function independently at home, in the community, work or leisure. 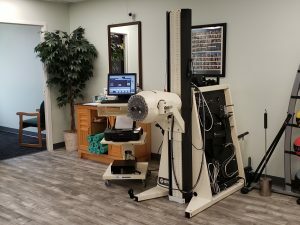 Treatment is performed by a licensed practitioner who uses appropriate equipment, modalities, and physical activities to encourage rehabilitation. The BTE PrimusRS is the ultimate system to facilitate physical disability rehabilitation. Significant scientific evidence on the Primus RS supports the use of the PrimusRS in rehabilitation decreases recovery time and facilitates functional recovery. It provides objective and real-time data for the duration of treatment beginning with an initial evaluation where the baseline of function is established, continuing through your patients’ entire rehabilitation program to completion of the physical rehabilitation program. PrimusRS: Click here to learn why our your rehabilitation outcomes are better reached with our treatment plans and the PrimusRS. BTE Eccentron: Click here to learn why individuals with medical conditions, such as cardiac diseases, knee surgery, obesity, arthritis, etc. benefit from our skilled occupational therapist plans that encompasses the Eccentron. 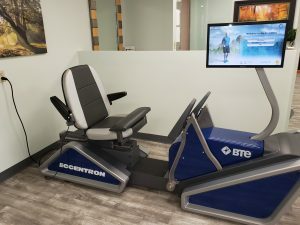 BTE Eccentron & Primus RS was built and designed for clients to expedite recovery from physical injury using scientifically proven techniques and methods. Once built, additional tests and evaluations were conducted on the equipment providing scientific evidence of the benefits of using technology. 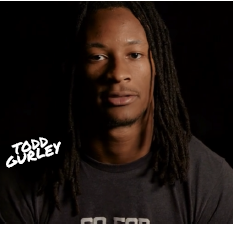 See This Success Story Featuring Todd Gurley of the LA Rams. Solo-Step is an overhead track and harness system designed to protect patients from falling during the rehabilitation process while giving them the confidence they need to break through their barriers in a safe environment. drive an expedited recovery time.